Aung San Suu Kyi: Still a Noble Democracy Champion? Myanmar stands as unstable and fractious as ever, is Aung San Suu Kyi still committed to the ideals she had when she came to power? During Xi Jinping’s state visit to the UK in 2015, Speaker of the House of Commons, John Bercow, took the opportunity to praise the leader of the opposition in Myanmar, Aung San Suu Kyi. During his introductory address, he lauded Mrs Suu Kyi as “the noble peace prize winner, democracy champion and international symbol of the innate human right to freedom.” Now, more than 18-months into her leadership term, the situation in Myanmar is beginning to make his comments look misplaced. 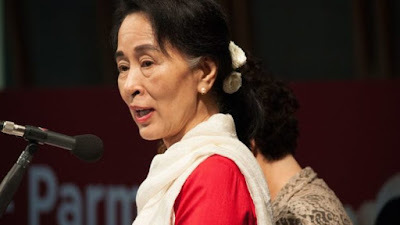 When the National League for Democracy (NLD) came to power after the general elections in November 2015, with Aung San Suu Kyi at the helm, the population hoped for their leader to bring peace to ethnic conflicts and promote democratic values across the country. Despite the military’s lingering power within government, Aung San Suu Kyi enjoyed some early success. She freed 69 student activists who had been jailed for their involvement in education protests the previous year and immediately established a UN advisory commission to offer counsel on the situation of the Rohingya Muslims in Rakhine State. She also entered peace negotiations with armed groups from the Kachin and Shan states in an attempt to bring peace to the regions. Despite her initial triumphs, Aung San Suu Kyi has been unable to fulfil her promises of bringing peace to Myanmar. The Rohingya situation has dominated international headlines for the alleged crimes against humanity taking place across the Rakhine State, yet Aung San Suu Kyi has remained silent on the issue. In the northern Shan and Kachin states, heavy artillery and air strikes in January led to a further 6,000 displaced civilians as fighting continues to rage across the region. Since her initial decision to set up the UN advisory commission led by Kofi Anan, Aung San Suu Kyi has refused to cooperate with any UN attempts to investigate the Rohingya situation. Her government refused to grant entry visas to Myanmar for the three UN experts tasked with investigating violence against Muslims in the country. When a fact-finding mission did go ahead, Aung San Suu Kyi’s government removed the top UN official in the country from her post and distanced herself from the report’s findings. Is bringing peace to Myanmar still a priority of her government? Given her reluctance to engage with UN attempts to investigate the atrocities committed and her lack of success in bringing stability to northern Myanmar, it would be fair to assume that bringing peace to the country is no longer of primary concern to her government. But she might have benefited from taking her own advice when filling the positions of her own government. She was obsessed with filling positions with those loyal to her and the party. Several members of her government have phoney degrees, prompting questions about the suitability of their appointments to the national government. Suu Kyi also allegedly instructed NLD legislators not to raise tough questions to her in parliament. Her government appointments suggest that for Aung San Suu Kyi, self-preservation and loyalty is a higher priority than appointing experienced, qualified and capable ministers, up to the difficult task of bringing peace to the fractious country. It is not only her pursuit of peace which has had to take a back seat now she has come to power, it seems she has also forgotten about her commitment to championing rights for minority groups. In 2015 the NLD asked Muslim candidates not to run as election candidates and since she has come to power, leading figures in her NLD party have been openly unsympathetic to rights of minority groups. Ko Ko Gyi called the Rohingya “terrorists” and accused them of infringing on Myanmar’s sovereignty. Nyan Win, NLD spokesman also said: “the Rohingya are not our citizens”. While Suu Kyi herself may not be anti-Muslim or anti-minorities, she knows that by defending the Muslim minority, she risks losing the backing of Buddhist elements in the country and will ignite clashes with the army. Rather than risk this, she seems content to let the promotion of human rights for minorities take a less prominent role in her government. However, curbing the free press is certainly becoming a leading feature in her administration. Between coming to power in 2016 and the start of 2017, 38 people faced online defamation charges for criticising her government. The 66D clause was the same clause in the telecommunications law that the military government used against Aung San Suu Kyi’s own supporters before she came to power. Now she is wielding it against her own critics. Activist, Aung Win Hlaing was imprisoned for 9 months after criticising the NLD in a Facebook post and calling President Htin Kyaw an “idiot”. Three journalists were also put on trial under the Unlawful Associations Act for meeting armed ethnic groups in Shan State in a clear clamp down on the free press. Aung San Suu Kyi’s advisor, Win Htein remembers a conversation the two shared in 1988, “she told me since she decided to get involved in politics, she would change everything. Any criticism directed towards her, she wouldn’t care”. Now in 2017, her words seem hollow as Suu Kyi’s government represents more continuity with her predecessors than change. Her government cares about criticism from the army, so they allow minority rights to be abused. They care about criticism from the Buddhist majority, so they no longer champion Muslim rights. They care about public criticism, so they imprison poets and activists for posting critical Facebook statuses. 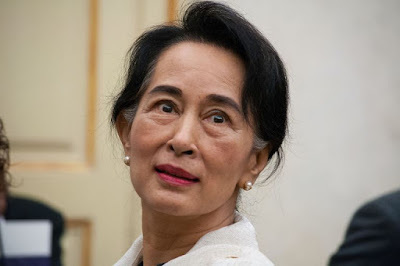 The Aung San Suu Kyi who won a Nobel Prize and made speeches standing on tables about the importance of democracy and human rights are almost unrecognisable to the woman in government today. Rather than representing the solution, she has become part of the problem, standing idle while Myanmar descends into genocide. If the Aung San Suu Kyi of 1988 could have a conversation with the woman of today would she still see herself as the noble peace prize winner and democracy champion that John Bercow described in 2015? Almost certainly not.